Renting in Houston: What will $1,000 get you? We've rounded up the latest rental listings via rental site Zumper to get a sense of what to expect when it comes to finding an apartment in Houston if you've got $1,000/month earmarked for your rent. Listed at $1,000/month, this 539-square-foot studio apartment is located at Richmond. In the apartment, anticipate air conditioning, hardwood flooring, a dishwasher, high ceilings, in-unit laundry, wooden cabinetry and stainless steel appliances. The building offers a business center, an elevator, a fitness center, on-site management, a swimming pool and secured entry. If you've got a pet, you'll be happy to learn that cats and dogs are allowed. According to Walk Score's assessment, the area around this address is friendly for those on foot, isn't particularly bikeable and offers many nearby public transportation options. Here's a 700-square-foot one-bedroom, one-bathroom apartment at 3331 Cummins St. that's also going for $1,000/month. In the unit, you'll get both air conditioning and central heating, carpeting, ceiling fans, a dishwasher, stainless steel appliances, high ceilings, in-unit laundry, a walk-in closet and a balcony. The building boasts on-site laundry, garage parking, outdoor space, a swimming pool, a fitness center, a roof deck, an elevator, storage space, secured entry and on-site management. Luckily for pet owners, both dogs and cats are welcome. Walk Score indicates that this location is very walkable, is bikeable and offers many nearby public transportation options. Next, check out this 700-square-foot one-bedroom, one-bathroom apartment that's located at 700 Tannehill Drive. It's listed for $1,000/month. 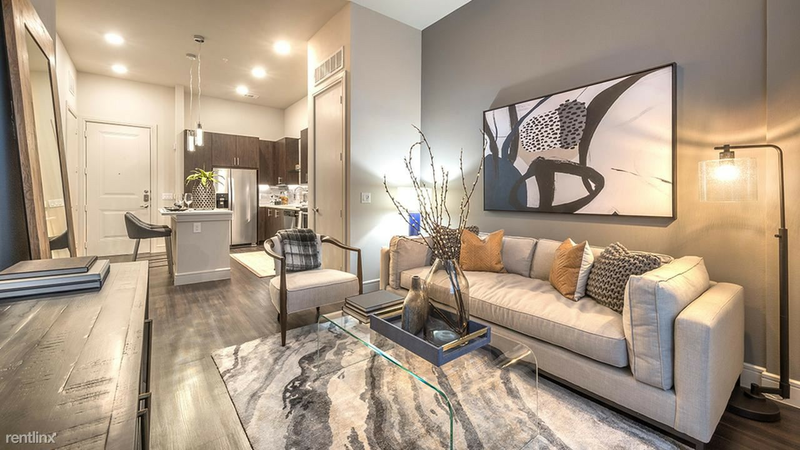 In the furnished unit, you'll get both air conditioning and central heating, hardwood flooring, a ceiling fan, a dishwasher, high ceilings, in-unit laundry, a walk-in closet, stainless steel appliances, wooden cabinetry and a breakfast bar. Amenities offered in the building include on-site laundry, garage parking, outdoor space, a swimming pool, a fitness center, a roof deck, an elevator, storage space, secured entry, on-site management, a swimming pool and a business center. If you've got a pet, you'll be happy to learn that cats and dogs are permitted. The listing specifies a broker's fee equal to one month's rent. Located at 7775 Interstate 10 Frontage Road, #71, here's a 580-square-foot studio apartment that's listed for $1,000/month. In the unit, you can expect hardwood flooring, air conditioning, high ceilings, a dishwasher, in-unit laundry, a walk-in closet, a fireplace, a balcony and a ceiling fan. The building offers garage parking, outdoor space, a swimming pool, a fitness center, a roof deck, an elevator, storage space, secured entry and on-site management. When it comes to pets, both meows and barks are welcome. The listing specifies a broker's fee equal to one month's rent. Walk Score indicates that this location is moderately walkable, has some bike infrastructure and has some transit options. Finally, check out this 712-square-foot one-bedroom, one-bathroom condo that's located at 14129 Memorial Drive. It's listed for $999/month. In the unit, you'll have a dishwasher, in-unit laundry, a balcony, air conditioning and hardwood flooring. The building boasts assigned parking, a swimming pool and an elevator. Both cats and dogs are allowed. The rental doesn't require a leasing fee. Walk Score indicates that the area around this address is moderately walkable, has some bike infrastructure and has some transit options.